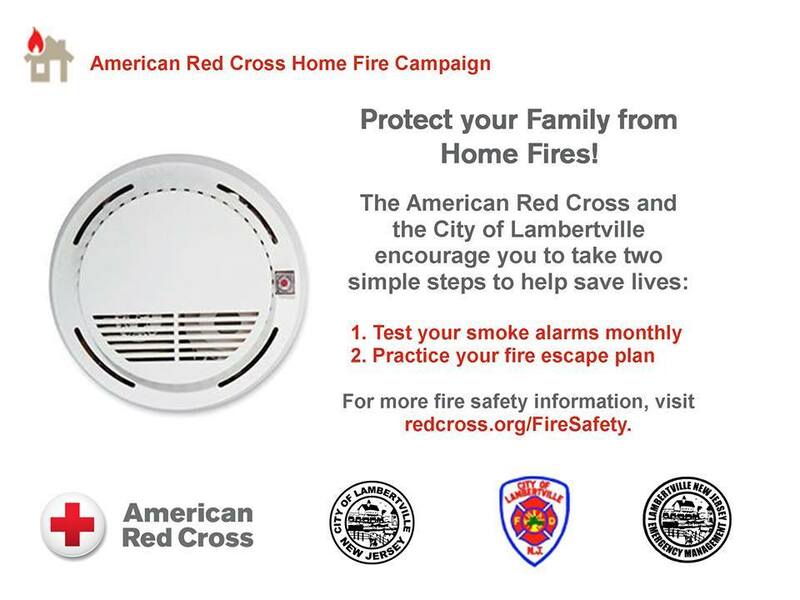 The City of Lambertville Fire Department, District #1 has partnered with the American Red Cross and City of Lambertville OEM to provide the residents of Lambertville with free, 10 year battery smoke detectors. As a result canvassing teams visited homes and distributed an estimated 796 packets which included Tips on Fire Safety, Flood and Emergency Evacuation information and a Brochure explaining what joining the Lambertville Fire Department is all about. Of the homes visited, roughly 30 residents requested to participate in the program. After receiving consent, crews installed 89 new smoke detectors all free of charge. The agencies involved concluded that this event was successful and are proud to be able to say that a difference was made in our community today. The Lambertville Fire Department would like to recognize Kevin Anderson from the Red Cross, Captain Justin Ege (LFD), Lambertville Mayor David Delvecchio as well as Lambertville OEM Director David Burd for their efforts in coordinating and planning this event. In addition, a big Thank You to all of the volunteers from the Red Cross and the Lambertville Fire Department who worked together to make this event the success that it was. Finally, we would like to thank Bruce Currie and Neice Lumber for donating the equipment needed for this campaign. If you missed out on this program, don't worry... The Fire Department has been provided with additional smoke detectors to allow for the continuation of this program throughout the year! Simply fill out the form provided below, and someone with be in contact with you shortly!